Northern Lapwing (Vanellus vanellus) populations are at an all-time low in Britain, and long have they been suffering from human activity. Throughout the 1800’s and 1900’s, the richness of their eggs meant they were collected extensively nationwide for food. As eager egg-collectors stripped the countryside of lapwing eggs, imported eggs from Holland had to plug the gap in the British market created by over-exploitation. The Lapwing Act of 1926 prohibited egg-collection in a bid to prevent further decline of the species. Despite this, it has been a case of ‘out of the frying pan and into the fire’ as the 20th century heralded wide-spread changes in agricultural practices, spelling more bad news for the lapwing. Lapwings are colloquially referred to as the ‘farmer’s friend’, a nod to both their farmland-nesting and pest-guzzling behaviours. In spring lapwings flock to sites of spring-sown cereal and root crops, fallow land and unimproved pasture. In the colder months, ploughed, pasture and estuarine land are their most likely haunts. However, their affectionate nickname now carries with it a certain irony, as changes to farming have resulted in this iconic bird suffering severe declines. In the 1970’s, the widespread switch from autumn-sown over spring-sown crops that continues today, means suitable lapwing nesting-sites have dramatically declined. Other modern agricultural practices such as increased land drainage and use of pesticides and chemical fertilisers have aggravated this decline. Lapwings can be found in Britain all year round, although there is an influx of migrators from September-November. They prefer to lay their eggs on flat, open ground. Because of this, nesting parents must possess both nerves of steel and espionage-esque qualities to protect their exposed young. If a predator sees through lapwings’ camouflage, parents may fly directly at the intruder, or create a diversion through a distraction display; drawing attention to themselves to lure the predator away from their eggs or helpless chicks. Another diversion technique they can adopt is to make visits to false nesting sites; if a human or other predator is watching them, they attempt to fool them into thinking their nest is elsewhere. This ingenious act of deception is shared by other birds species such as robins and jays. They are aided in their crafty ways by the camouflage offered by their feathers. Mainly black with a white belly, their backs are mottled with green, helping them blend into their grassy surroundings. Despite their predominately plain colouring, they cut a dash with their handsome head crests and a purple shimmer to their wings. They complement their splendid plumage with spirited aerial displays that males perform in spring, and in winter they tumble through the dark skies in their flocks. 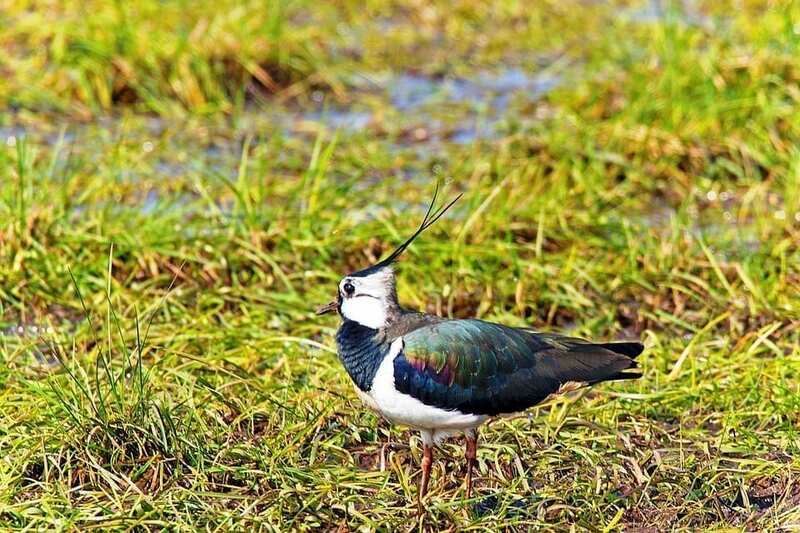 Their year-round presence means the lapwing’s eerie call is synonymous with both the crackling frosts of winter and the green flush of early spring. In fact, lapwings have a connection with Easter. Their eggs, along with the eggs of many other species, were traditionally exchanged and eaten at Easter. In the Victorian era, lapwing—or plover eggs—were a particularly popular delicacy thanks to Queen Victoria’s penchant for them and Mrs Beaton’s inclusion of them in her famous cookery books. Modern day Easter-egg hunts mimic the ritualistic wild collecting of eggs at this time of year. A stranger connection is their link to the Easter bunny. Lapwings sometimes ‘repurpose’ hare’s open air ‘forms’—a shallow scraping that hares shelter in. Sometimes droppings or even the hare itself would lie alongside the eggs, or an egg-collector would disturb a hare as they discovered a nest. From this, a belief arose that the hares laid the eggs, and so the idea of the Easter bunny could in fact be a combination of a hare and a lapwing! Late March to June is the lapwing breeding season, when winter flocks disperse and head to nesting sites. This is when habitat mosaics are crucial, as the parents require different types of habitats for breeding and nesting. Very soon after hatching, parents lead their young away from the comfort of their nests and venture into feeding grounds, such as wetlands, ideally where vegetation is low. After 5-6 weeks, the young are ready to fly and can leave the nest. Infant survival is fraught with pressures, and lapwings may lay up to four replacement clutches if none of their young manage to survive. Lapwings get their common name from the undulating nature of their flight, but their other distinctive feature—their call—has earned them many region-specific nicknames. The ‘pee-wit’ is a common one, derived from their bubbling, undulant call. In Lancashire they are ‘chewits’, in Norfolk ‘pie-wipes’, and in some areas of Scotland ‘peasiewheeps’. Whatever their name, there are now around 80% less lapwings in England and Wales than there were in 1960. Scottish lapwings are slightly better off, but they still have declined an alarming 29% since just 1987. Farming methods that are more sympathetic to wildlife will help halt this decline, as will the return of wilder spaces. So whether you know it as a hornywink or a toppyup, let’s hope Cambrian Wildwood will be home to lapwings in the future.